GATESVILLE — As the blowtorch in 32-year-old Nicole Gillespie's hand pierces the cool air around her with the smell of gas, she feels like she's making history. Gillespie, an inmate at Woodman State Jail in Gatesville, is part of the first HVAC class that has been offered to women at any Texas state jail. Texas prisons have offered similar classes to men for years. 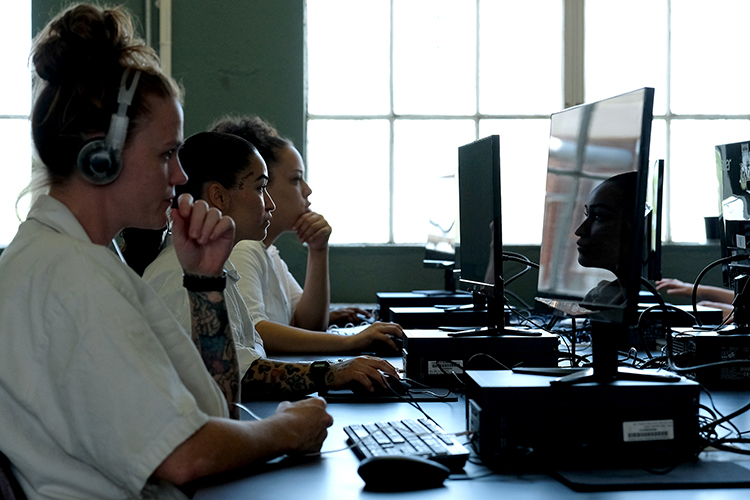 Gillespie’s classroom partner, Amber Kenyon, 38, recognizes that the area she’s working in is male dominated outside of prison, but that's not stopping her from pursuing a passion she’s found in the four years she’s been incarcerated. Officials at both the Windham School District and the Texas Department of Criminal Justice disputed the report's findings, saying women in prison are given fair opportunities to further their education. Texas Department of Criminal Justice spokesperson Jeremy Desel said the agency “vehemently disagrees with that report," particularly with the part that says women can only receive up to an associate's degree while men can get bachelor's and master’s degrees. Desel said the state does offer female inmates three bachelor's degree programs through Texas A&M University. Windham School District superintendent Clint Carpenter said the district has strengthened program offerings for Texas’ growing female prison population. More women are in prison because of "tough-on-crime" prosecution of drug crimes, psychological and physical trauma and poverty that largely impacts women, the report said. Adding new programs for women can be expensive, particularly with “high-technology” job training, Carpenter said. Last year, Windham School District requested additional funding from the Legislature to expand classes for women but did not get the money. The district asked for $800,000, which would have added 3,696 industry certifications for women. The district's current two-year education budget is more than $104 million. Mayberry calls his female students a "cut above the rest." Kenyon, who is in her fourth year of a 22-year prison sentence for drug possession, tears up as she talks about her son, who recently graduated from a technical education program at his prison. She’s working with Windham School District to make sure he gets a job once he leaves. But for now, Kenyon continues to dream about what her passion in prison will turn into once she's released — perhaps moving to Houston and working on cruise ships, fixing their air conditioning units.